Paint correction is a term that is now commonly used by both professional car detailers and car cleaning enthusiasts worldwide to describe the process of restoring and rejuvenating the paintwork of a vehicle, mostly through the elimination of surface imperfections, that dull, oxidize, or haze the surface by reflecting light off in various directions, therefore detracting from a true and proper, clean, sharp, reflection. 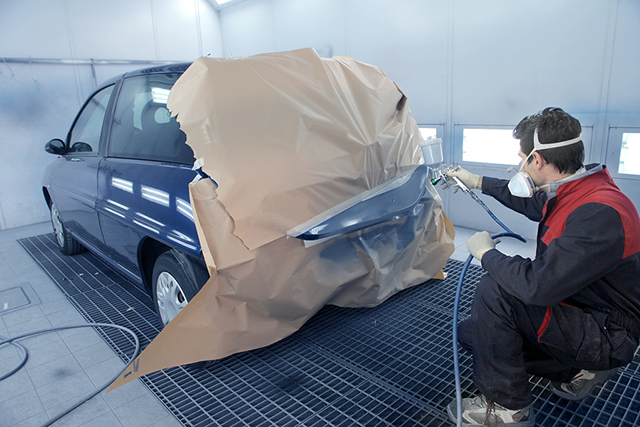 A new car paint protection like wax keeps everything mother nature can throw at your car away from the paint. These imperfections include things like swirl marks & fine scratches, bird dropping etching & acid rain etching, hologramming & buffer trails, and random isolated deep scratches (or RIDS). The term paint correction should only really be used if these imperfections are properly removed and are not just merely covered up or hidden with filler based products. The actual corrective process itself comprises of a small amount of clear coat or paint being removed from the surface with the use of abrasive polishes, which are applied and worked in with appropriate polishing machines, in order to level out the surface. During the paint correction process it is common for a paint depth gauge to be used. This measures the thickness of the paint on the metal panel and is used before, during and after the process to monitor how much material is being removed and ensure an excess is not removed which could leave the paint too thin or even cause irreversible damage such as a strike through the paint. Specialist halogen or LED lamps which replicate the effect of direct sunlight on the surface are also used during the process to check the condition of the paintwork and see how successfully the surface scratches and imperfections are being removed.